Annual award or longue durée importance? I know, I know, I’ve said before that Horse of the Year really doesn’t matter – and from an Annales School perspective, that is very much the case. The fact remains that people beyond the core constituency of horse racing insiders and fans will remember Zenyatta – and wonder who Blame was (if his name come up at all – which it very well could, if he’s a success at stud) – but they are not the ones voting for the annual honor. Neither am I, of course – but I’ve still got an opinion. On the one hand, we should not overlook Blame’s accomplishments (though overlooked they were indeed as they occurred – good luck finding the Stephen Foster or even the Jockey Club Gold Cup, in which Blame was second, on television unless you’re really looking for it); one could argue that by giving more weight to races outside the Triple Crown – particularly ones that once had more resonance – it’s good for the sport as a whole. But the same point could be made about many of Zenyatta’s races – and she’s got a much larger collection of G1 wins to show for her efforts. 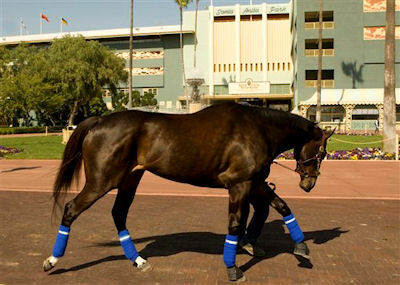 If one of the goals is to reward owners who keep their horses racing beyond age 3, both Blame and Zenyatta fit the bill (although both were late bloomers) – but it seems a shame to then praise the removal of a horse from the racing scene who had just started to show off his true capabilities. One wonders if he would have been whisked off to stud with a third-place finish – or if Blame would have been burnishing his breeding resume at the track for a little while longer in that instance. After all, the wonderful Gio Ponti is coming back again – and his body of work is considerably more impressive. As for Zenyatta, a Horse of the Year award might be viewed as something of a lifetime achievement honor – but that’s not a problem in my view. I argued last year that (prior to the Breeders’ Cup), her campaign had been overly cautious, while Rachel Alexandra was taking on all comers (except, perhaps, for one very large mare). I would have been quite happy for them to share the award, but this year, I can’t really see any reason to spend much time considering anyone apart from Zenyatta. It would have been entirely understandable to see her retire after last year’s Breeders’ Cup Classic, perfect record intact – but the fact that her connections were willing to bring her back again, and to participate in a thoughtful discussion on her place in the sport with the wider media – deserves special recognition. After a particularly difficult few years – the breakdowns of Barbaro and Eight Belles, the general Bridge-and-Tunnelness of the Big Brown crowd that kept the horse largely a footnote - Zenyatta’s return this year gave the sport a positive face once more – both equine and human. I do wonder if a tougher series of races would have had Zenyatta more tuned up for the Classic this year – but it’s just an idle curiosity. Her place in history was already assured by her brace of G1 wins and, of course, especially by her Breeders’ Cup performances – all of them. She gets my would-be vote for Horse of the Year – and here’s hoping those who can actually exercise the option agree. Of course, if they do not, it’s of no great importance, as the racing history gods have already spoken – do you see a Blame Breyer? I agree, Zenyatta deserves to win this year. Blame accomplished more on the track but I think it’s “heart” over record this year. She truly captured the heart of the nation with her quest for perfection leading up to the Breeders’ Cup Classic.